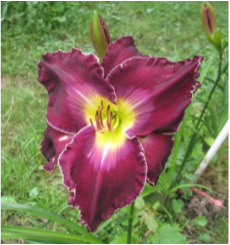 ​A round, ruffled violet purple daylily with a round darker purple band and pencil-thin lighter-streaked midribs, EYE DON’T KNOW is a very bold, simple flower with great plant habit (lots of buds!) and it's lots of fun to grow! 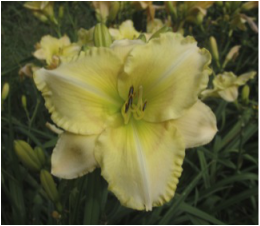 A light, bright yellow daylily with a ruffled fine, gold edge, a slight cinnnnamon halo, a more intense yellow to green throat, and white midribs, FINE GOLD UNIVERSITY is a flower that we have enjoyed growing for several years. It is a great garden plant and reblooms fabulously! 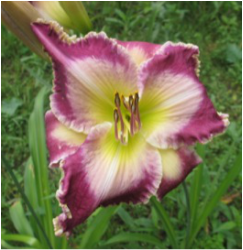 A very rich velvety purple daylily with lighter brushed watermark, strong yellow throat, and striking white metalic edge. Wide triangular petals supported by dark, recurved sepals. With very nice, clean foliage and excellent performance, ROYAL ATRIUM is a standout in the garden and is often remarked upon by garden visitors. Very fertile. A large, raspberry violet daylily with a huge, near-white watermark spreading almost to the edge of occassionally pinched petals complimented by a bright yellow to green throat that extends out onto recurved sepals. With a beautiful bubbled white and yellow edge, WASHED BY THE WATER is one of the earliest large-flowered daylilies to bloom in the garden. Increases well and occassionally reblooms. A fabulous cerise red with lighter watermark accenting wide, rounded, ruffled petals and bright yellow to green throat. A fine white filigree edge ocassionally appears on warmer days. 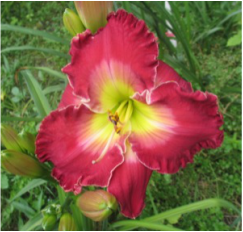 One of the finest red daylilies we have ever seen or grown. We are very excited to be able to offer it to you now! Very fertile. Enjoy!